Black Eyed Peas frontman Will.i.am has revealed the "i.am+" case for iPhones, which launches next month for those with more money than music taste. The i.am+ will come in two iPhone 4/4S flavours at first, with the basic "C.4 contemporary" model, setting punters back £199. This features interchangeable lenses for standard, fish-eye and zoom capabilities, adds a chunky flash and makes a phone look distinctly snapper-like. With many attachable iPhone lenses on t'interweb for less than a tenner - which aside from minimalist designs, appear to serve an near-identical purpose - Will.i.am's price tag does seem a smidgin on the steep side. And while this is a completely separate venture, the performer is Intel's "Director of Creative Innovation", so surely you'd expect something a little more, er... innovative? 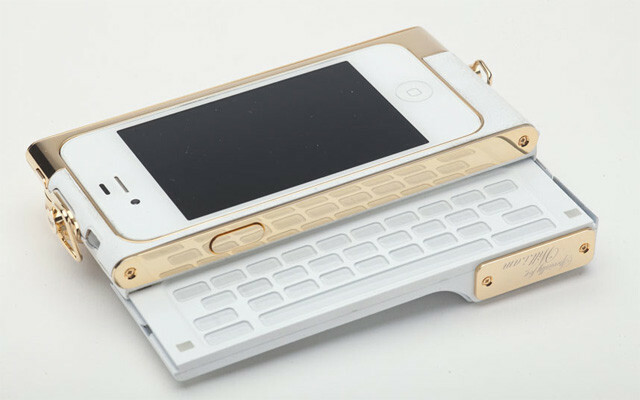 OK, the inclusion of a slide-out keyboard - which comes with the "V.4 vintage" version for an additional £100 - does bring this glorified iPhone case a little redemption, but with it comes a whole lot of tacky gold trim. Perhaps I'm the last person to trust when it comes to street cred assessments, but that look surely makes an iBlower more Del Boy than Tommy Boy. Either way, if you're a tempted Will.i.am fan, you'll be pleased to know these i.am+ cases go on sale from 6 December, initially exclusive at London's Selfridges. A version for iPhone 5 will follow in 2013 with a dedicated 14Mp sensor and flash. According to the pop star himself, that's where the magic lies as it will transform the 8Mp camera into a 14Mp one, with an all-new sensor and flash.